The rhino is the second largest land animal after the elephant. They have thick, bare skin, which is sometimes arranged over their bodies like plates of armor, barrel-like bodies, gigantic heads, and incredible horns protruding from their faces. 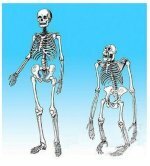 The mass is supported by short, stout legs and wide feet that have three both front and rear. Each individual toe ends in a hoof, which leave a footprint that looks like the Ace of clubs. These animals have remained unchanged for thousands of years, so the resemblance to dinosaurs like triceratops is intriguing, but their closest relatives are actually tapirs and horses. There are 5 species of rhinoceros, 3 living in Asia, and 2 in Africa. All rhino species are endangered, except for one subspecies of white rhino, which has recently been brought back from the brink of extinction. The most familiar rhinoceros species are the black rhino and the white rhino, but both of these animals are actually grey in color. The term "white" stems from a misinterpretation of the word "wide" describing the shape of the white rhinos mouth, and the black rhino is so called because it is often the color of the mud it covers itself with. 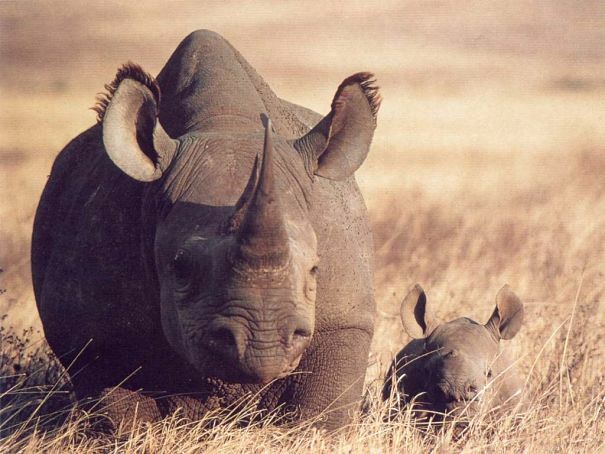 The African rhinos can be 6 feet tall at the shoulder and average about 3000 pounds. They have massive, low-slung heads that feature unusually forward eye placement, and long, sharp, dramatic looking horns. The word rhinoceros basically means "nose horn" in Latin. 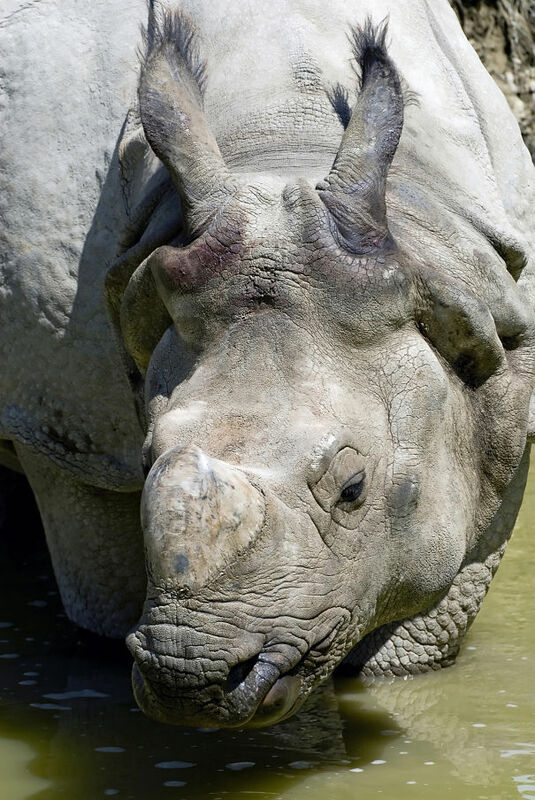 The white, black and Javan rhinos have two horns, while the Indian (also known as the greater one-horned) and Sumatran, (also known as the hairy rhinoceros), have one. These horns are made of keratin, like human nails, and grow out of the skin in a similar fashion. Rhinos are intimidating looking creatures, and will charge when confronted or threatened, but they are not generally aggressive towards humans, and only 2 or 3 attacks are reported a year. In comparison, fatalities from elephant attacks number 400 to 500 a year, and hippos kill about 2,900 people annually! The Asian rhinos in particular, are shy, reclusive, and even timid. The rhinoceros is strictly vegetarian, grazing on grasses or browsing trees and shrubs for leaves, shoots and fruits. 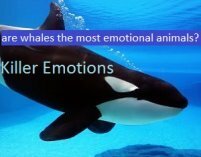 They are mostly solitary, especially when feeding, since their food intake of 40 to 80 pounds of vegetation a day, requires them to spread out. Small social groups do form, consisting of females and their young, or young males banding together, and herds of as many as 30 individuals may be created near water sources during drought conditions. The white rhinoceros and the black rhinoceros live in small pockets of grasslands on the floodplains of Southern and Eastern Africa. Because of their size they require a home range of about 5 square miles that is rich in resources. Abundant vegetation is vital to survival, but unlike many African animals who regularly go for many days without drinking, the water from the plants rhinos eat is not sufficient for them, and they will visit watering holes multiple times a day, drinking heartily. During drought, they may have to walk up to ten miles between their water source and their food source. Wet areas also supply them with muddy banks that they will wallow and bathe in, coating their sensitive skin with mud as protection from heat and insect bites. Rhinoceros skin is a paradox. It can be an inch thick in some areas to protect them from battles with other rhinos, but it is actually very soft, and subject to sores and sunburn. The black rhinoceros is particularly prone to inflamed red areas of skin called "rhino sores". Usually forming in the region of skin behind the front legs, rhino sores are parasitic infestations of tiny worms living just below the skin. Rhinoceroses spend over 12 hours a day foraging and grazing across their territory. 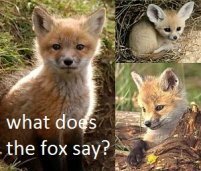 They are both nocturnal and diurnal, being most active at dawn and dusk, and alternating a few hours each of feeding and resting throughout the day and night. During the hottest seasons, they will feed mostly at night, and rest and wallow in the heat of the day. The white rhino is by far the most social species, often seen in small communal herds of 5 to 10 individuals, and it is believed that loss of territory is forcing them to become more and more tolerant of each other. Black rhinos are far less gregarious, and are also the most pugnacious of the rhino species. Adult male black rhinos can be quite territorial and may battle to the death. Although the rhinos within a given area may not see or socialize with each other much, they use communal dung heaps that act as message boards. Both males and females will relieve themselves in these areas, usually kicking around in the pile to spread their scent. Rhinos have very poor eyesight, but excellent senses of smell and hearing. 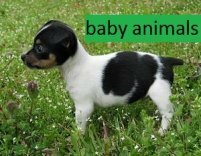 They are fairly vocal as well, with approximately 10 to 12 specific snorts and calls of warning, greeting, excitement, anger and delight. Dominant male rhinos establish territories by marking the perimeters with urine and dung, and actively defending the area against other aggressive males. 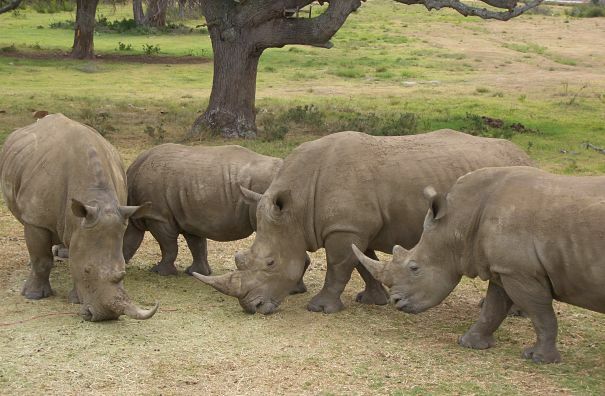 A large number of male rhinoceroses, although sexually mature, take a subordinate role in rhino society, and are tolerated by dominant males so long as they display submissive behavior. These males may never even attempt to establish a territory, and will never have the opportunity to mate. 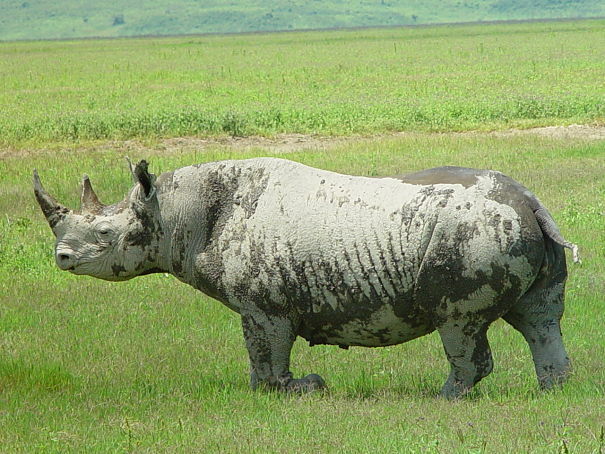 The female rhinos home range may overlap several male rhinos territories. She and her youngsters freely move throughout these areas, and females themselves are not generally territorial with other females. She comes into estrous several times a year, and males can detect her condition through the scent of her urine. Dominant males will follow and court her, attempting to herd her into their territory. Once there, the male may try to keep her close until she is willing to mate. At this time, males may become extremely aggressive with each other, and violent fights may occur. White, black and Indian rhinos have courtship rituals that involve males and females sparring with each other. 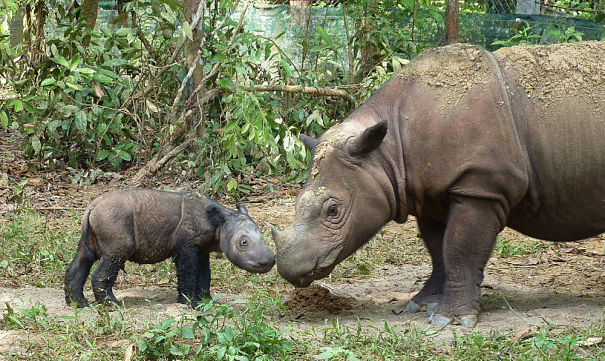 The Javan and Sumatran rhinos are so shy and rare, that very little is known about their reproductive habits. Once the female accepts a males overtures, the pair may stay together for a few days or even weeks, even sleeping in close contact. Or, the mating may be over in just a few hours, and she may go on to mate with other males during the same period. The female is pregnant for approximately 16 months. When she is close to delivering she will drive off any youngster she currently has. 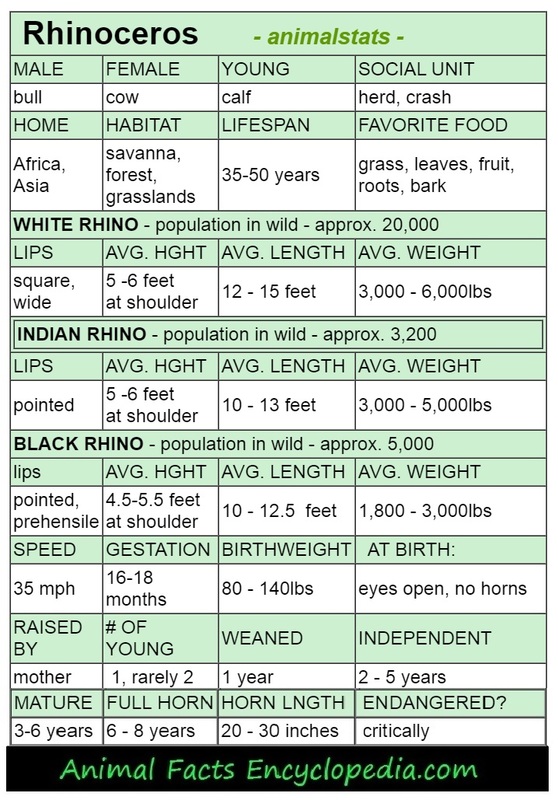 The birth may take place standing or lying down, and the newborn rhino is gigantic, weighing anywhere from 75 to 150 pounds. The baby is born without a horn, which begins to grow within a few weeks, but is otherwise a miniature adult. Their eyes are open, they are vocal, and they stand and nurse within minutes. Rhino calves begin to sample solid foods at just a week or two old, and are generally weaned at 2 years. They grow very quickly over the first few months of life, gaining as much as 5 pounds in a day! 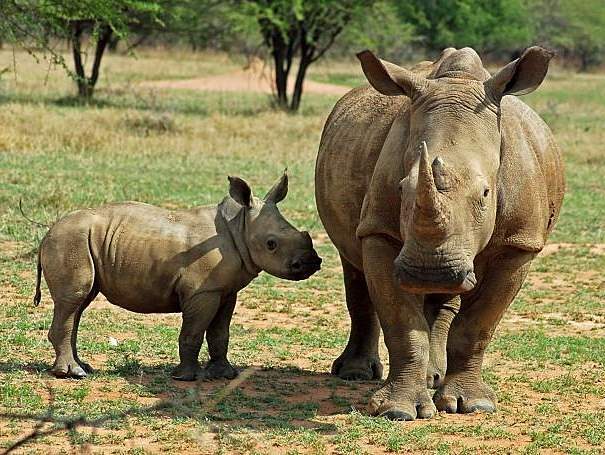 When traveling, white rhino calves usually walk in front of their mother, probably because, with her poor eyesight, she can keep track of it better. Black rhino calves, however, always follow behind. This may be because the black rhino lives in heavier vegetation, and the mother must clear the way for her calf. Young rhinos are raised by their mothers only, and will stay with her for 2 to 5 years, until she is ready to give birth to a new baby. Juveniles that have been driven off by their mothers may band together in pairs or little groups until they reach sexual maturity at 3 to 6 years. Females usually have their first birth at 5 or 6 years old. Most males will not attempt to claim their own territory until they are at least 10 years old. 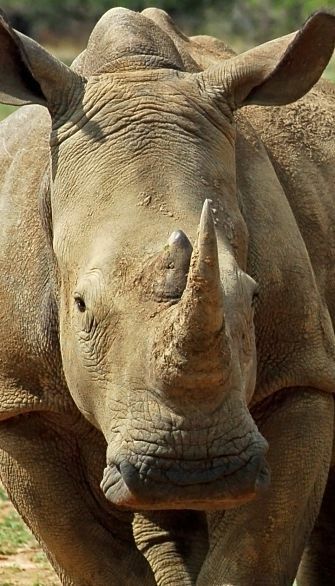 Both male and female rhinos of most species have horns, and in the black and white rhino, the females front horn is often longer, although thinner, than the males. Rhinos have been hunted for thousands of years for the magical and medicinal powers people believe their horns possess. Thought to cure anything from cancer to impotence, rhinoceros horn can demand thousands, sometimes tens of thousands of dollars a pound. At an average weight of 7 to 8 pounds each, a white rhino horn could be worth $100,000 dollars by the time it makes it to the markets of highest demand, China and Vietnam. These are life changing numbers, and the temptation is worth the risk for many poachers finding a way out of poverty, and usually being exploited by other players. 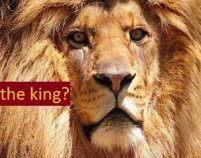 Approximately 500 poachers were shot and killed by authorities in South Africa's Kruger National Park in the last 5 years. Many more are fined or imprisoned. But the trade remains a healthy one, and international efforts may not be enough to save the rhino in the wild. The rhinoceros horn, like a human nail, will grow back in a few years if cut off, so some groups are choosing to tranquilize and de-horn adult rhinos. The operation is done with a chainsaw, and a large amount of the horns base, where nerve endings are still present, must remain in order not to harm the animal. While most poachers kill rhinos outright in order to remove the horn, even if they were to tranquilize, they will not leave any priceless horn material behind, and the animal would still die. The largest of all the rhinos, the white rhino can reach over 6 feet at the shoulder, 15 feet in length and 6,000 pounds! But the white rhino isn't white, it is grey. This is a grazing animal, built with a gigantic, downward dangling head, that is just long enough to mow the ground, with methodical, side to side sweeping motions. 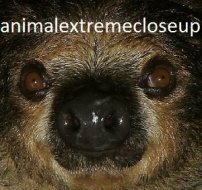 The top lip is soft and mobile while the bottom lip is stiffer and serves to shear grass blades very close to the ground. 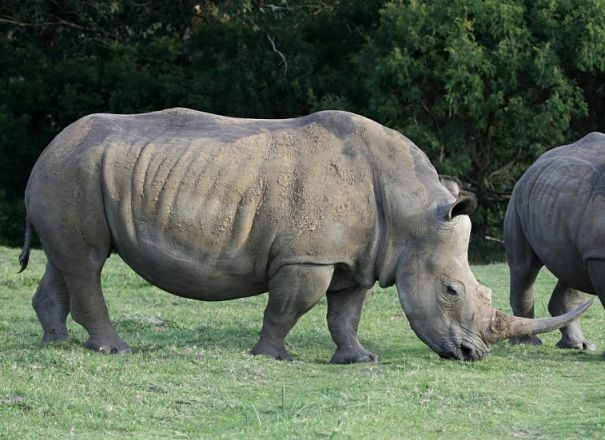 The head of the white rhinoceros is proportionately larger than that of the other species, allowing it to comfortably graze for hours on end, and there is a corresponding shoulder hump of powerful muscles to support it. When turning around in tight spots they will rotate their rear ends around their front legs in a movement reminiscent of a tractor trailer, but out in the open, and when moving in a straight line, they can be quite swift, with a powerful, and even graceful trotting gate. There are two subspecies of white rhinoceros. At an estimated 20,000 wild individuals, the Southern white rhino is the most populous of all rhino subspecies, while the Northern white rhino is extinct in the wild, and is, as of 9/16, represented by only 3 captive individuals. These 3 precious animals, 1 male and 2 females, are kept under armed guard at Ol Pejeta Conservancy, a sanctuary in Kenya. 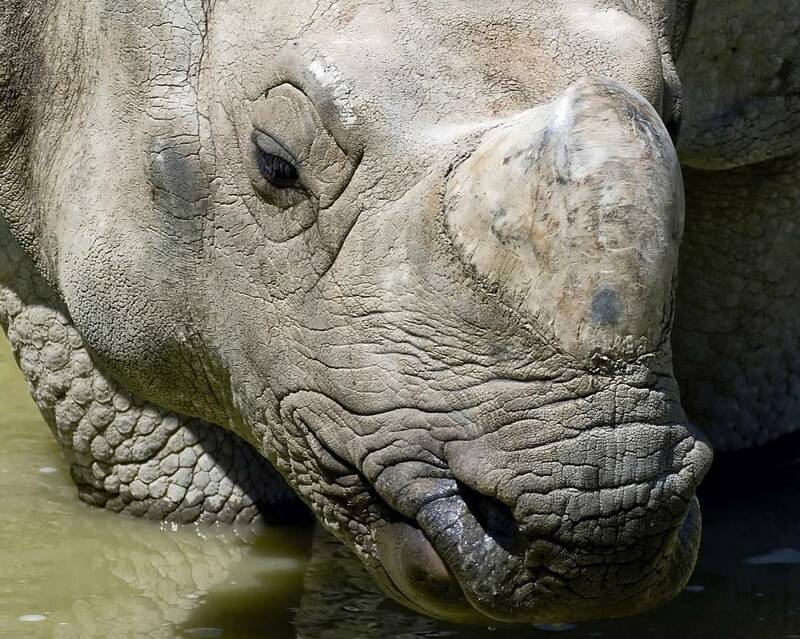 Attempts are being made to save the Northern white rhinoceros through in-vitro fertilization, but time is running out. White rhinoceroses live on the grassy plains of Africa, and are specialized eaters. They mow grass blades close to the ground, massive mouth fulls at a time, with their broad muzzles and strong lip pads. They are a bit more social than other species, and confrontations tend to be more ritualized and less violent. Dominant males maintain territories but allow submissive males to pass through without much incident. Females move through the territories of numerous males, and females with young will occasionally travel together. The third largest of all rhino species, the black rhino can be 5 1/2 feet at the shoulder, 12 1/5 feet long and over 3,000 pounds. 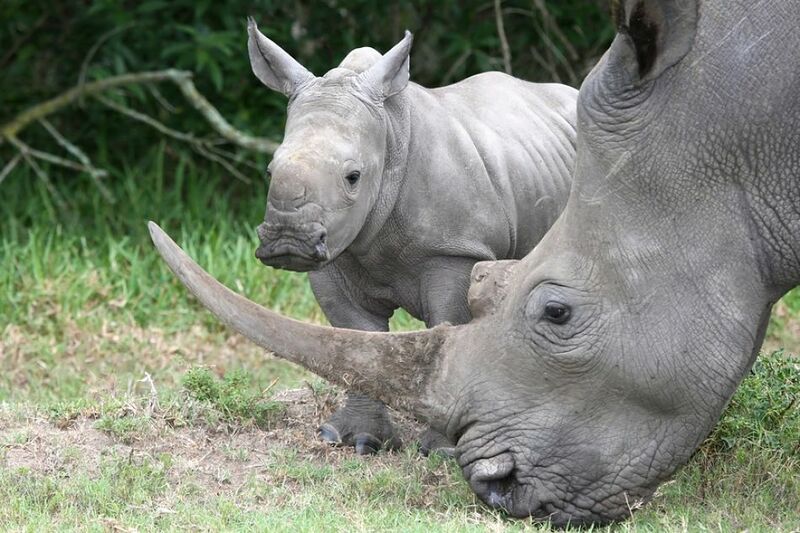 The origin of their name isn't really understood, because, like the white rhino, the black rhinos skin is also grey. In fact, there really isn't any difference between their average skin color of the black and white rhinos, but it is possible that the mud black rhinos cover themselves with is darker, overall, in the areas that they live, occasionally making them appear black, or ashy in color. 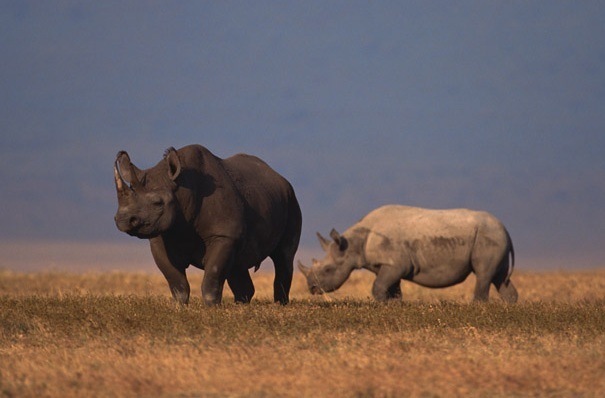 Black rhinos are mostly solitary, with adult males staying almost exclusively by themselves, and females co-mingling mostly just with their own offspring. 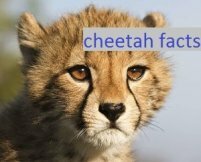 The individuals in a particular range are called a "clan", and the dominant males will maintain territories whose boundaries overlap. When two males meet, they may engage in ritualistic horn wrestling, which allows for a test of strength, without the risk of injury or death. Black rhinos are designed for foraging, not grazing. They don't require open grasslands, but instead live in more rugged terrain, often hilly, rocky or wooded. They make trails throughout their range that tunnel directly through the brush, and will simply crash through vegetation when no trails are present. Black rhinos have much smaller heads than the white rhinos, and so don't have a prominent shoulder hump. They have a more forward head placement that puts their mouths in line with the low shrubs and bushes they feed on. 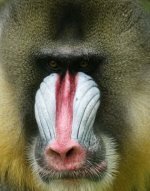 A pointed, prehensile upper lip, that almost resembles a birds beak, curls around shoots, leaves and fruits, and pulls them into the mouth. Because of this feature, the black rhinoceros is often referred to as the "hook-lipped" rhino. The black rhino has a reputation for being a far more dangerous animal than the white rhino, but its habitat may be part of the reason, since most rhino attacks occur when the rhino is startled, and the black rhino lives in much denser areas where visibility may be limited. The adult black rhinoceros has no natural predators, but elephants will often run them off, and mature female elephants, for whatever reason, are often intolerant of them. The Indian rhino is more recently being referred to as the "Great one-horned" or "Great Indian one-horned", or simply "One-horned" rhinoceros. In the past, it was regularly referred to as the Asian rhino. This is the second largest rhino species, but is sometimes considered the largest. 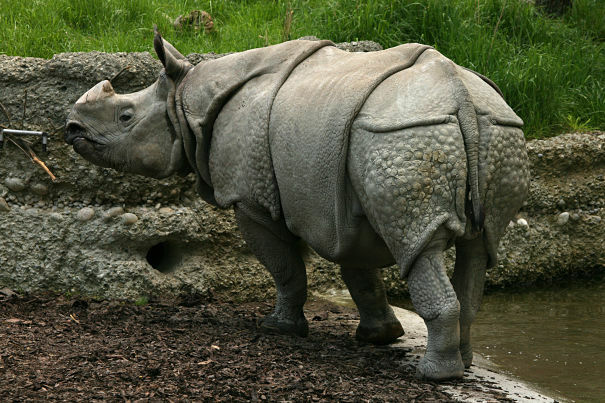 Indian rhinos are, on average, taller than white rhinos, often at 6 1/2 feet at the shoulder, but white rhinos tend to be heavier, and the largest individuals recorded are white rhinos. The Indian rhino has a single horn on its muzzle, and incredible, thickly folded skin, that absolutely looks like a full coat of armor. The skin even has numerous warty bumps, called tubercles, across the shoulders and flanks that look like rivets, and the effect is positively amazing. Despite its aggressive appearance, the Great one-horned rhino is a relatively peaceful creature, with very little of the territorial jousting that occurs among the more familiar black and white rhinos of Africa. In fact, the Indian rhino doesn't even use its single 2 foot long horn in battle. 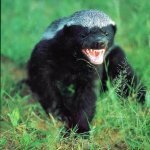 If they do have confrontations, they use their large, tusk-like lower incisor teeth, to bite or jab their opponent. Indian rhinos eat both grass and brush, and so their lips are less pointed than the black rhino, but still have a small prehensile tip. They spend evenings and mornings feeding, and hot afternoons wallowing in swampy areas. The indian rhino is mostly solitary, only coming together to mate. Babies are particular large, and are rarely under 125 pounds at birth. This is an endangered species that has experienced an amazing comeback over the last several decades. With population estimates at less than 600 individuals in 1975, they have regained a solid foothold with well over 3,000 animals as of 2016. The Sumatran rhino is the smallest of the five rhino species, with individuals rarely reaching 10 feet in length or more than 4 1/2 to 5 feet at the shoulder. These rhinos have a reddish brown color, and can have quite a bit of hair, particularly on the legs and belly. The hair tends to disperse as the animals mature, and older Sumatran rhinos also tend to loose the reddish tinge. Sumatran rhinos are solitary and secretive, living at higher elevations than the other species, in tropical rainforests of Sumatra and Borneo. They have been recorded at altitudes of up to 6,500 feet, but logging ventures have depleted their available territory, and the future looks bleak for these fascinating creatures. 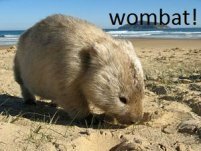 They are very critically endangered with only 80 to 100 individuals believed living in the wild as of 2016. 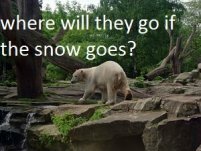 There are some specimens living in Zoos, but they do not thrive in captivity, and many have perished, even under expert care. Sumatran rhinos are rather primitive, and are most closely related to the extinct whoolly rhino, a common ancestor of the Asian rhino species. Sumatran rhinos live in heavily forested and hilly terrain, and are remarkably adept climbers, pushing through the gnarliest brush, and straight up slopes too steep for a person to climb except on all fours. They create tunnel like pathways through the thickest undergrowth, that remain for other animals to utilize. With its single horn and heavily pleated skin, the Javan rhino, also known as the Lesser one-horned rhino, looks and acts very much like the Indian rhino. The Javan rhino has a small head by rhino standards, and the horn is also small, rarely reaching more than 10 inches. Females don't usually develop a pronounced horn at all, but the base is present. The Javan rhino is one of the rarest large mammals in the world. In 2016 less than 50 individuals survive in Indonesia’s Ujung Kulon National Park, on the island of Java. 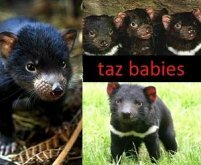 These few are the only population left in the world, and none exist in zoos. The Javan rhinoceros once existed throughout Cambodia, Sumatra, Thailand and Vietnam, but the last wild individual outside of Java was poached in Vietnam in 2010. Vietnam is the largest consumer of rhino products, for medicinal, spiritual and ritualistic purposes, which are not only made from the horn, but from hide, hooves, blood and urine. Even rhino ears and tails are highly prized in Vietnam, so the Javan rhinos small horn, or the lack of a horn on Java rhino females, did not protect them from extreme poaching. One encouraging point about poaching in Nepal and throughout Asia, is a trend since the late 1980's towards the use of liquid and powdered rhinoceros urine in place of rhino blood, for medicines to treat asthma, lung ailments and fever. White rhinos are probably called "white" due to a misinterpretation of the word for "wide" referring to their wide, straight lips. The Black rhino may be called black because they often cover themselves with very dark mud. The largest rhino horns can be over 4 feet in length! 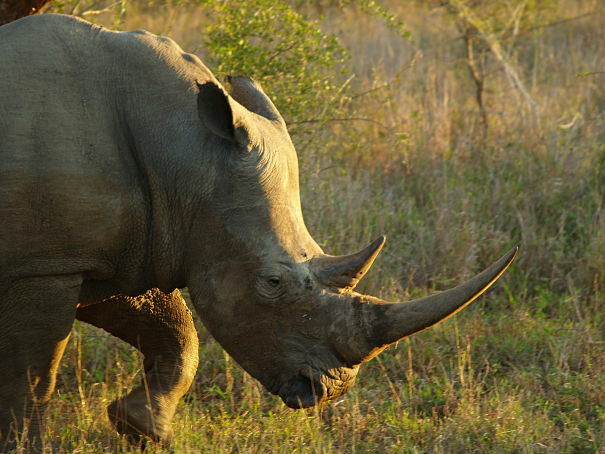 Rhinos are not nearly as dangerous as they look, and only about 3 attacks a year are reported. 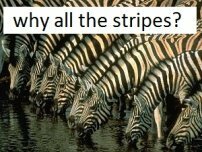 It is occasionally suggested that rhinos have "extra ribs", but they actually have 18 pairs, which is the same number of ribs that horses have. MATURE FULL HORN HORN LNGTH ENDANGERED?